This question is not new. But, it has been again raised in view of the incidents of attack and arson of Hindu temples, homes and properties by Islamic fundamentalists in the Hathazari area near the port city of Chittagong. According to information from across the border, the chief executive officer of Zila Parishad of Chittagong quoting intelligence inputs blamed Jamat-e-Islami and its student wing Chatra Shibir for this. This was also corroborated by the SDO of Hathazari, Shekh Farid Ahmed as well as officer in-charge of the police station Samuel Alam. It was a pre-planned and pre-meditated plot as could be understood from the sequences of events. 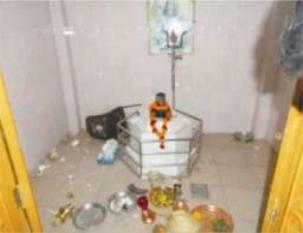 Besides defiling and vandalising the historic Lokenath Baba temple at Nandirhat, the fundamentalists ransacked three other temples of Sri Sri Jogdeswari Maa, Jagannath Bigroho and Kalibari. On the occasion of the two day holy celebration at Lokenath temple, a procession was brought out by the devotees and disciples which was to move through the main thoroughfares of the sub-divisional town Nandirhat. As the procession reached near the Jame Masjid at Kazipara, as is the known practice, some among the radical elements objected to the microphone playing devotional songs and deliberately created a tense situation not only to disrupt the celebration but also to cause communal flare up. These aggressive and intolerant elements, mostly youths, did succeeded when they planted and spread the rumour that some from the procession pelted stones at the masjid, smashing its windowpanes. It was enough to surcharge the mounting tension. 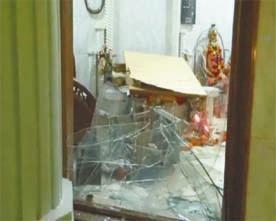 In the volatile situation, the idols of Hindu gods and goddesses being taken in the procession were damaged. Though Sheikh Hasina Government and its district administration acted, it was too late to control the situation. 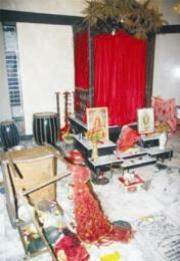 The frenzied bigots went on arsons, burning Hindu houses and business interests, besides vandalising the temples. And all this happened when at the initiative of the sub-divisional administration of Hathazari, a peace meeting was in process at Shailbala City Corporation Higher Secondary School with leading citizens and public from both the Hindu and Muslim communities. Quite intriguingly, as a part of the designed aggression, the fundamentalists had brought in youths from other areas for attacks and arsons in order to camouflage their identity. Panicked Hindu residents of Hathazari, Nandirhat and Chittagong went on line and wrote letters in the print media, seeking safety and security from the government. The preliminary report submitted by an investigation agency of the country had indicted Jamat-e-Islami and its cohorts which worked in tandem to instigate communal frenzy with the sole objective of destabilising the Hindu settlements. The report clearly stated that with due permission and declared programme, the organisers of Lokenath Mandir at Hathazri were to take out a procession through the fixed routes of the town. A group of Jamat-e-Islami activists inside the mosque were determined to disturb the procession on flimsy pretext and inflamed the communal passion and in the process launched series of attacks on Hindus for hours. The Hindus of Bangladesh however did muster courage to register their protest and indignation. Puja Udjapan Committee of Dhaka led by freedom fighters and eminent citizens with hundreds of people formed human chain and organised public meeting with a call for defeating the fundamentalist and communal forces. Similar voices of protest also came from Chittagong social, literary and cultural bodies which were addressed by secular and saner sections of citizens from both the communities. 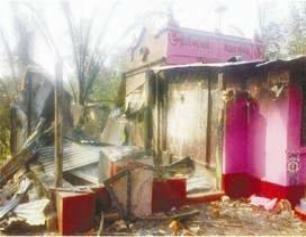 Surprisingly, the Bangladesh media, print and electronic, totally blacked out the heinous attacks on Hindus. It did not get even a passing reference. Banglanews.com justified it for the sake of communal peace and harmony. But, the threat remains. In fact, ever since the Awami League Government of Sheikh Hasina assumed power, radical Islamic groups with the tacit backing of Bangladesh Nationalist Party of Khaleda Zia had been active to sabotage the democratic process and unsettle the Hindu friendly government. Behind the rebellion within the paramilitary forces of the country in February, 2009 was the involvement of this force. Its ugly manifestation again came to the fore in the mid part of January this year when an abortive army coup was planned with the involvement of yet another terrorist group Hizb-ut-Tahrir with its base in Iran. All these forces have combined together to subvert democracy and impose Shariat Law.